Like an empty stage just waiting for your direction, a deck, patio or garden can display container plants with great drama when considering the pottery choices you have. When you are looking for some added color, character, or garden accessory, pottery is the easiest choice. You can choose from so many different types of plant materials, that when selecting the planter to put them in, it can be over whelming. Terracotta, Rustic, Glazed, High fired, low fired, Poly Resin, Concrete or metal are all available today. Our suggestion is to read the descriptions on our website or contact a customer service representative. They are trained to know the facts and have a lot of experience with the newer materials. Whether you do your gardening on an apartment deck, a typical suburban or on a vast countryside, containers will simplify the process. You can make the plantings portable and contained so they don't take over the whole yard. By picking up the most lush flowers at the local garden center you can put them immediately in to a colorful garden planter and have instant design, and color. By placing just one planter of bright flowers on your windowsill, patio or front porch you will immediately create an miniature garden. Just starting out with a couple of potted flowers can create an urge to get more containers and flowers because it is so easy to do and so rewarding. Remember that by planting in garden containers instead of directly into the ground you are portable, compact and convenient. Plant spring bulbs in April, Red white & blue flower on the 4th of July, a living Christmas tree for the holidays. Planting in pots makes it easy! Read more.....PLan now for next season. 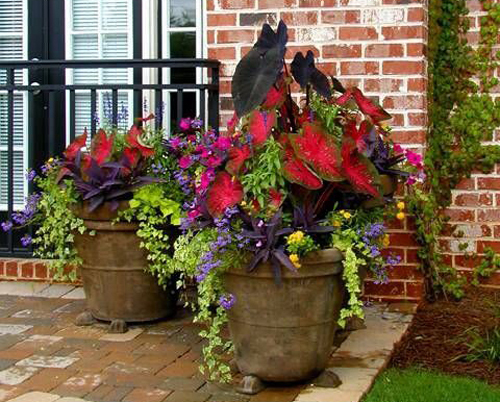 Container gardens add splashes of color and life to your yard, patio or porch areas. If you live in a tiny city apartment or on a large country estate, planting in containers is a way to add splashes of color and natural beauty to your environment. 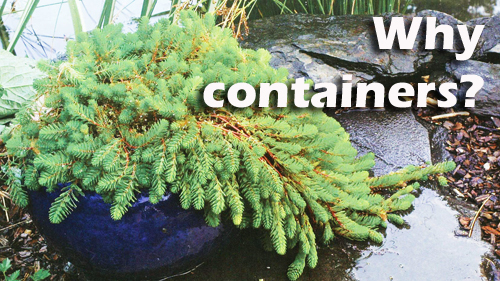 When there isn't soil available, for planting, or where soil is really poor quality, containers are the solution. They add color where there isn't much and they can add a lovely texture when something extra is needed. Steps, decks, driveways etc all need some kind of enhanced beauty, and pottery is the solution. 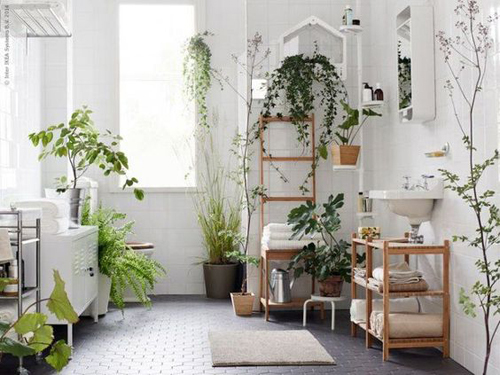 When you use potted plants you can instantly add color and decoration. The day of the party you need some color - add a pot bursting with local flowers. You want to move your plant from shade to sunlight during certain times of the day? Container plants are easy to move! Below are a few tips to help you along! 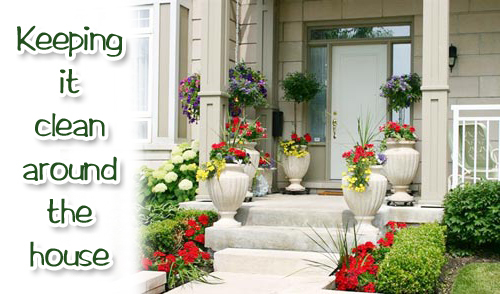 Start with a planter that you really like and then select the plants. Make sure there is enough room for the root system of the plants. 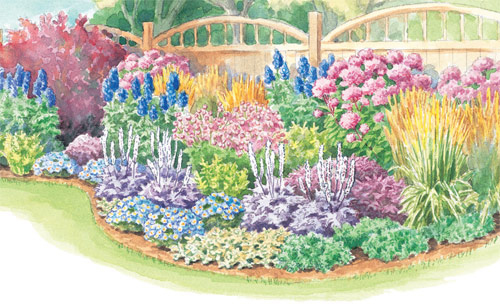 Create a look with plants that compliments each other with similar form, size and texture. Add contrasting elements for interest. Grouping containers for effect is fun to do. Mixing type of pots and styles with colors is easy and it makes a great impact. 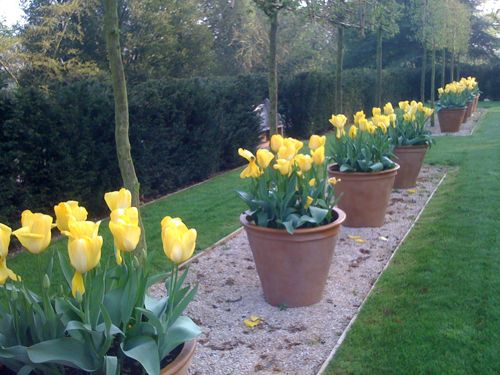 Read more.....Focal points in your garden! This twisted willow branches set into a chimney pot offer an attractive support for ivy, and will provide welcome interest in the winter garden. The instructions are below and are fairly simple. Send us photos of your finished project! Place the planter pot that you are going to use in it's final position. Make sure that it's in shade or half shade. 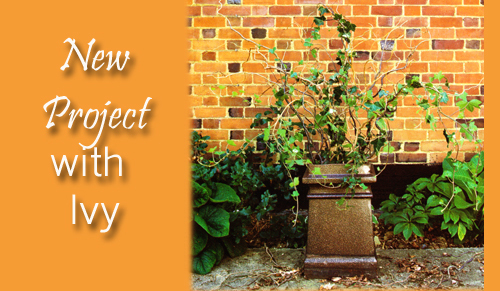 This is a great time to place the planter next to a blank wall that needs some green growth. 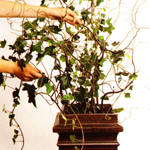 Place the chimney pot full of ivy inside and position it in the center bottom of the pot. Half fill with compost. 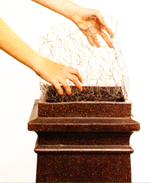 Fold or crumple the wire netting and push down into the chimney pot so it rests on the compost. Arrange the willow branches in the chimney pot of ivy, pushing the stems through the wire netting. 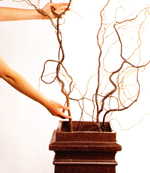 Use the wire netting as a form to support the branches so they are placed in a well rounded and decorative design. The wire frame will give support to the flexible ivy plant. Besides for appearance the wire frame will support the ivy as it climbs up the branches. Rest the ivy plant, in its pot, on the wire netting among the willow branches. Fill the chimney pot with compost to within 4 inches of the rim. Cut loose any ties and remove the cane. 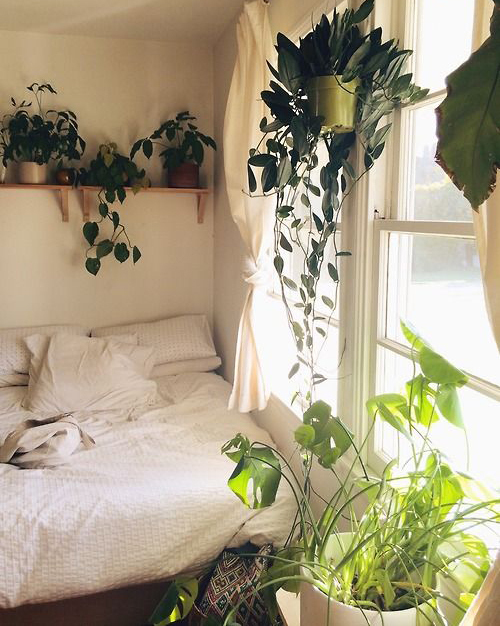 You want the ivy to be loose and free flowing, not tangled in anyway. 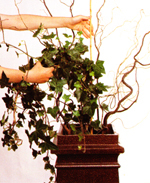 Arrange the stems of ivy over the willow branches and make sure that they are supported and not just drooping. We want to promote decorative growth. Water everything. The beginning may look rather unfinished, but as the ivy grows, wrapping around the willow branches and settles into it's new surroundings it will attach itself and look lovely. Make sure some trails drape over the sides of the planter. Final Tip: You may find that some of your twisted willow branches take root in the compost. 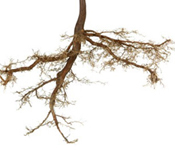 Plant a rooted branch in the garden where it will grow into a tree. It will eventually be quite large so do not plant near a house if you want to avoid this. Plant anytime of year....even Winter! 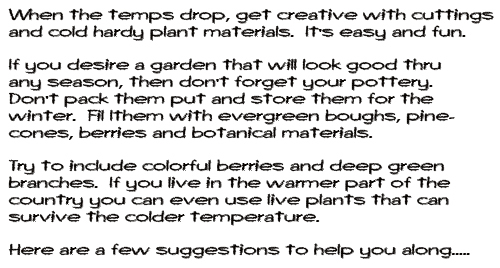 Read more.....Grow your own desserts! Read more.....Keeping pets from nibbling indoor plants. this is such a great idea and it looks so easy to do. i am going to try it with the brand new container i just purchased from arizona pottery. i think the sticks sticking out of the planter really adds that special touch. thanks for the tips. 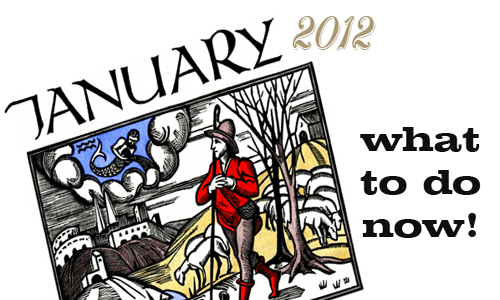 January - Now what do we do? 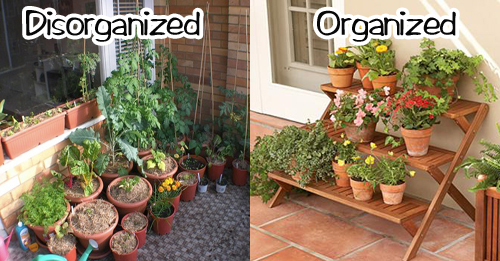 Are you thinking about the kinds of things you could be doing in your yard or garden area about now? Well here are a few suggestions. 1. Bare Root fruit trees. Plant apples, apricots, peaches, and plum fruit trees right now. They are readily available at most home and garden centers and local nurseries. Choose low chill varieties like Anna, Dorsett Golden, Ein Shemer, apples; Blenheim, gold kist or katy apricots. Bonanza ! !, desertgold or floridaprince peaches or beauty plum. Bare root roses are also being offered. You can plant these directly into the ground or use a decorative large garden planter. You can find many in light weights like Poly Resin or fiberglass. 2. Sow seeds of cilantro, dill, epazote, fennel, and parsley in moist soil, then sprinkle the soil with water after sowing. Continue to water regularly. Sow seeds of heirloom peppers such as Ancho, a wide, dark green poblano type that is medium hot. For tomatoes consider ruffled Pink Accordion, a large sweet heirloom perfect for stuffing. Plant in Poly Resin. 3. 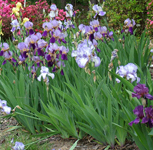 Fertilize bearded iris plants either in the ground or planted in lovely garden pottery. Spread all purpose bulb fertilizer around the plants, scratching it in with a rake or hand trowel. Water thoroughly toward the end of the month. 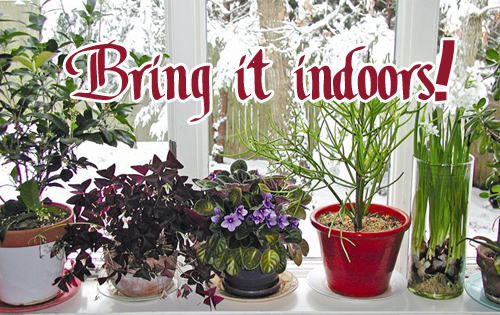 Protect your potted plants from cold. Most plants withstand cold better if they are well irrigated before a frost. Keep an eye on the weather report, and water deeply when a frost is forecast. Move tender plants under a overhang or into a garage. To protect citrus, place a tall stake around the tree and drape with burlap or frost blanket. 4. 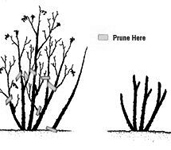 Now is the perfect time to prune your rose bushes. Choose five or six sturdy canes and prune them back to 18", then remove the weak, inward facing and crossing canes and branches. Dab cuts with household glue to discourage borer infestations. If you don't cut them back now, when spring arrives and they start to grow they will be wiry and spindly. They branches will droop and not flower well. These are all easy and good things to be doing now so get out there! Read more.....pot bare root trees now. Now is not the time to ignore your garden pots. 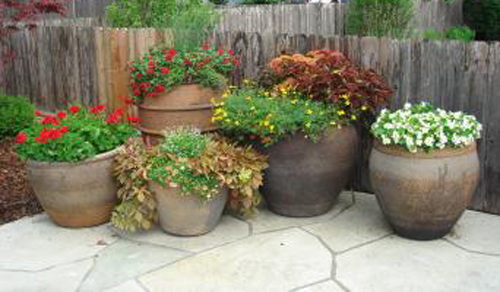 With family & friends coming for the holidays, you don't want to leave your garden pots empty and uninviting. Below are a few suggestions that will help motivate you to get them in entertaining condition. Upping diversity spices up small containers. As a rule, more variety equals more impact. When designing small pots, use this to your advantage. Although there is a plethora of textures in these combination, similar forms unify them. 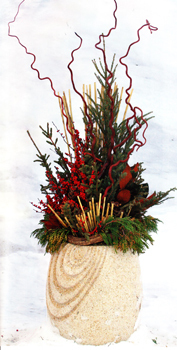 Moss covered orbs available at many craft stores, poppy pods, and African knobs dot the horizontal plane, while cinnamon sticks, pheasant feathers, and whitewashed cacoa stems add height. 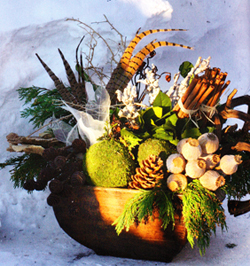 This planter is filled with Manzanita branches, pheasant feathers, whitewashed cacoa stems, cinnamon sticks, preserved salal, incense cedar, poppy pods, banana sticks, sugar pine cones, moss covered orbs, african knobs and skeletonized leaves. Unexpected living plants give pots a twist. You may prefer all living material during the growing season, but winter is an opportunity to mix living plants with nonliving objects. In warm climates, hardy succulents, such as agave, make an unexpected addition to winter plantings. Lemon cypress adds a soft, vertical touch, while yellow twig dogwood offers a hard edge and rosemary supplies subtle movement. Keep watering these living plants until the ground freezes. Round glass balls provide contrast to the sharp, spiky forms in this arrangement. The rustic ceramic container complements the surrounding cool colors of winter and, with proper care, holds up well throughout winter. Northern gardeners might consider using cut dogwood stems and enjoying this arrangement inside. 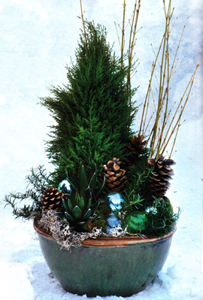 This planter contains, Jeffrey pine cones, Glass orbs, reindeer oss, mood moss, lemon cypress, yellow twig dogwood, rosemary and agave. 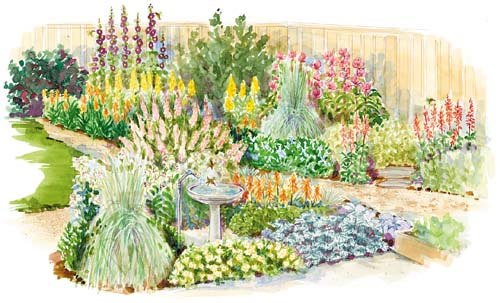 It's awfully cold outside but that shouldn't stop you from planning your garden or patio areas for next Spring. 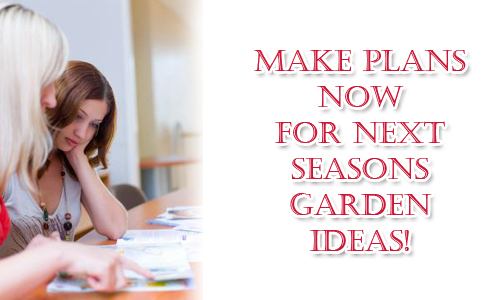 Now is the time to collect catalogs, magazine photos, online ideas and more. 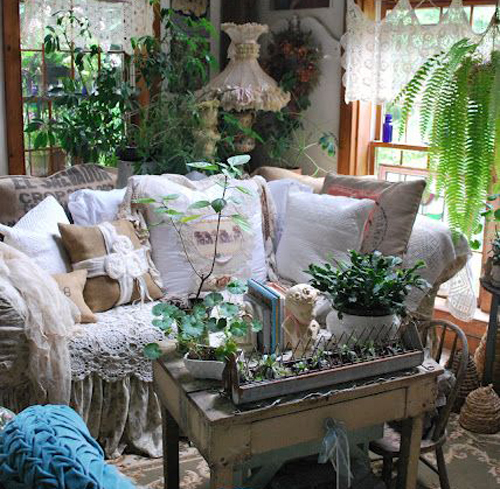 Get them all together, grab a cup of coffee, a close friend and sit down and dream......it's free! 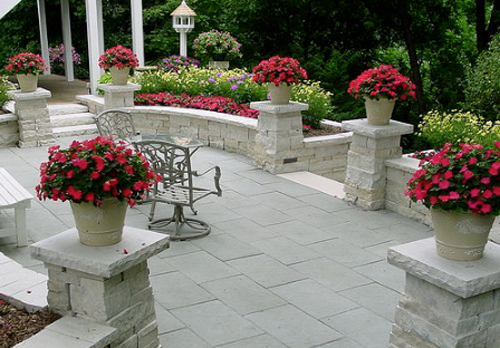 Start by deciding on the kind of feel or mood you want to project with your garden or patio area. Choose a theme, such as color, plant materials, architectural focus, pottery type and styles and any decorative statuary you want to use. Scan thru the latest websites and garden magazines for ideas on new styles of pottery available. List the types of plants you like so that you can ask your local nursery personal when and if they will be carrying them next season. Have a point! Think what is the point of this area. Are the plants for cooking with like herbs and cacti? Do you want them located close to a patio door or kitchen entry? Will the plants be for a cutting and decorating with inside the home. Will you need your potted plants to act as a privacy screen. Make sure the size, shape and type of the plants you are using fit the point of use. Spend time planning it now so that you won't experience a disappointing result next Spring. One of the most important factors to consider is where the sun is at different times of the day in your patio or garden area. Make sure that if you use certain types of plant materials that need a considerable amount of direct sunlight that you locate those planters in those spots. You can change, pots, soil and locations but you can't change where the sun hits at different times of the day. Decide now how much work you want to put into the project in both prep time and maintenance. Don't plan a high maintenance plan if you don't want to be bothered once the time arrives for blooming. The main thing to consider is that at some point we want you to sit down and enjoy all this hard work and effort so don't go for the uber difficult plants to maintain. Finally draw out the plan on the computer. Mark where potted plants will go and where you will plant directly into the soil. Mark where you will place that heirloom statue you have stored in the garage for the last 5 years. Draw where you will set up a eating area or fire pit. Read more.....Pot Bare root plants now. Read more.....Use evergreens to combat winter starkness. To Cold for Containers? NEVER! If a material looks good and stand up to winter weather, why not reuse it from year to year? The reusable red bamboo poles in this pot offer a strong vertical accent, while living variegated boxwood provides more vertically and a striking backdrop. Tall, bold gestures such as these are especially important in winter designs. People aren't as likely to stop and linger when the weather is blustery, so designs need to read well from a distance. For this container, wrap dried magnolia leaves around African knobs - all available at dried flower retailers and craft stores. 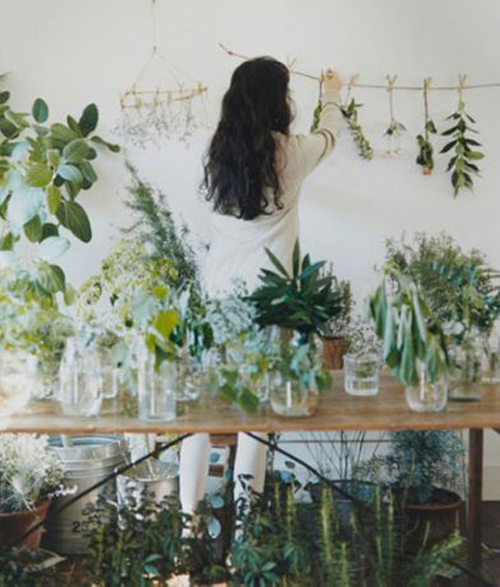 Reconstructing natural materials and arranging them in clusters is another great way to make designs pop. The Pot used in this photo is from the Vietnamese Black Clay line. It is high fired and can with stand colder temps. It will not absorb water and therefore will not freeze. 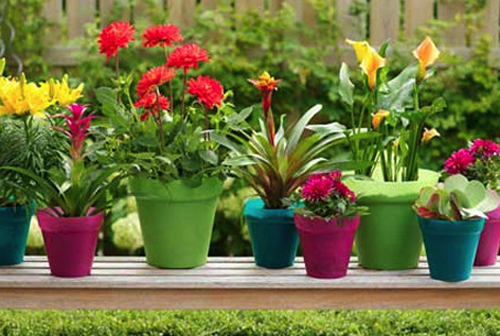 With the bright colors in the plant materials a subtle colored pot can be used with great success. 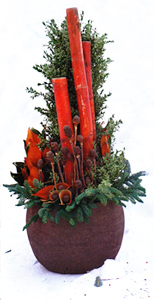 This container includes Variegated boxwood, stained red bamboo poles, African knobs, Southern magnolia and noble fir boughs. Now to enhance your winter designs with unique containers: Look to the colorful glazes and decorative etchings on pots as a source of inspiration. The detailed carving on this container draws the eye up to the planting, while the mahogany-stained kuwa stems and black spruce boughs continue the progression up and out. 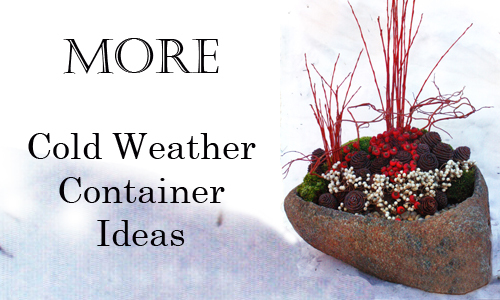 Luckily, creating winter containers doesn't have to mean gardening in frigid temperatures. For this container, you can fill a plastic growers pot with potting soil and arrange the planting indoors. 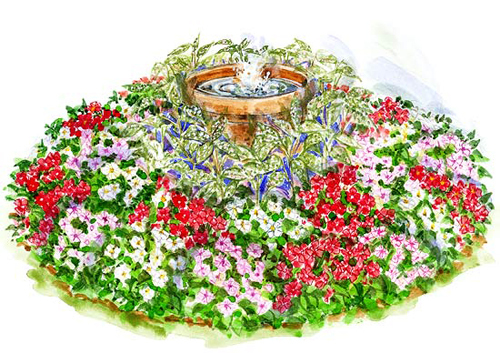 Once the design is finished, take it outdoors and drop it into the decorative container. One thing to consider when using a container like this granite one shown or one of our concrete planters is that once it's filled it will be to heavy to move around so make sure it's in a place you can leave it till next Spring. This pot has Mahogany stained kuwa stems, reed bamboo, black spruce boughs, southern magnolia, incense cedar, driftwood and winterberry. We hope this give you some great ideas. Stretch your imagination, apply a few of these tips and you should experience great success.